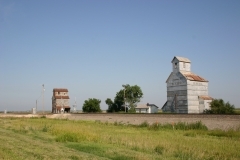 The Gano Grain Elevator and Scale House is located along the Atchison, Topeka, and Santa Fe Railroad line at Ardell. The elevator features a balloon frame covered in metal sheathing and has a 15,000-bushel capacity. The scale house is rectangular with lap siding and wood roof shingles. The scale is positioned in front of the scale house. 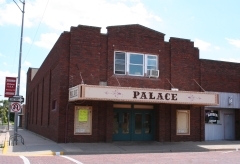 The complex was nominated for its architecture and association with the local grain storage industry. Kinsley craftsman and Civil War veteran David A. Lester created the Kinsely Civil War Monument in 1917. 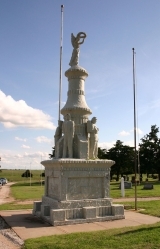 The concrete sculpture is one of only three known multi-figure Civil War monuments in Kansas. With no known formal art training, Lester's creation made of cement is truly vernacular and unique. Lester alone designed and executed this hand-built monument at the age of 74, fashioning the entire monument with whatever tools were available including his own hands. It was nominated for its artistic significance as a handmade vernacular memorial.